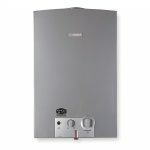 The most affordable tankless water heater that fits in your budget. These two are beginner models that come in 2.68 & 3.17 GPM flow rates. Some brands are too expensive to be popular; some lack the efficiency to stay on the market for long; some are genuinely good products that just don't catch on. Rheem is a brand that defies all of these expectations. Not only do they sell solid, inexpensive products, but their tankless water heaters can also cut your energy consumption in half. But which Rheem product is right for you? Which will best suit your needs as a homeowner? 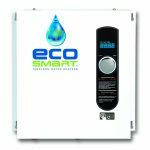 Let's take a look at two Rheem electric tankless water heaters. As you can see, you could almost call them twins, but with the 13 having a slightly higher flow rate (GPM). They have the same basic functions, and they're even the same size. So when choosing between these products, the technical details and cost differential are probably what will make your decision. Both the RTEX 11 and the RTEX 13 are electric units, meaning they work through a system of internal sensors and heat exchangers rather than firing up a live flame. This is great for homeowners who don't have natural or propane gas and who don't want to deal with complicated ventilation systems. One drawback of these electric units is their lower flow rates. They might not meet all of your hot water needs if you live in a large home or require "simultaneous usage" of hot water appliances. In fact, both the RTEX 11 and the RTEX 13 are what's called "point of use" units, meaning they should be installed directly at or near the faucet where you want the hot water. You may have to install several of these units around the house to fulfill all of your needs. Both the RTEX 11 and the RTEX 13 can comfortably offer water as cool as 80°F and as hot as 140°F. This is excellent news for residential buyers who wish to very temperatures at different locations! It should be noted that 100°F is more than enough to kill germs and bacteria. In terms of flow, customers do report that your GPM rate will depend on how hot you want your water and how cool the water is coming into your house before it's heated. The higher the temperature demands, the less your GPM. So that's something to consider if the flow rate is a deciding factor in your purchase. In better news, flow delays are quite small with Rheem. This isn't a unit where you have to wait 60+ seconds for the water to come flowing out of the tap. You'll get hot water instantly and for as long as you require it. The good news is that despite all their parts, both the RTEX 11 and the RTEX 13 are relatively simple to install. A Rheem technician can do it in a matter of hours, and this is the recommended method so you don't void your warranty, but even if you're going at it as a DIY project, you shouldn't face many difficulties. Less expensive than other electric heating units. 1 unit is not suited for a whole house. Customers love the RTEX 11 and the RTEX 13. 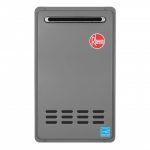 Rheem is a popular brand for a reason, and that reason is that they create sturdy, long-lasting products that work as advertised. In terms of which model you should buy for yourself, it really depends on your likes and dislikes in a heating unit. The RTEX 11 is less expensive, but according to customer reviews, it also offers fewer savings on the whole. The RTEX 13 has a higher flow rate, but on the flip side, customers report that its flow delays are slightly longer. What functions and features are most important to you? 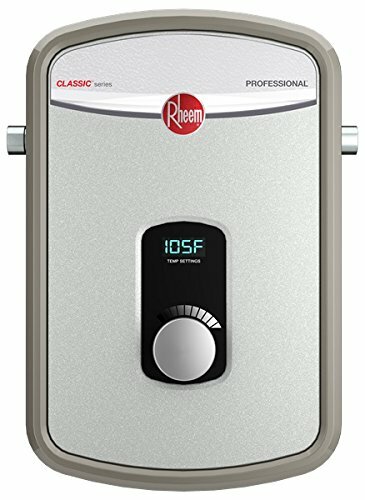 If you're looking for a no-fuss, point-of-use tankless water heater, you can stop your search with the Rheem RTEX 11 or the Rheem RTEX 13. Not only are they inexpensive, easy-to-use units, but they're also fantastic for energy savings and living a greener life. Check out the Rheem product pages on Amazon to learn more! We have a hunting shack in northern Wisconsin near Minocqua. We want to install a liquid propane shower system and we have no electricity. We were going to buy a Marey unit of either 4.3 or 3.1 gpm. We were told at Home Depot that Marey does not ship the units to northern tier states. So we are inquiring about a Rheem liquid propane unit that ;you could recommend that would fulfill our needs. Our water is stored in a 150 gallon tank located in our rafters so the water in the tank is not from a well and is close to room temp at about 65 degrees. We need the unit to supply water for a lightly used shower and hot and cold water facet, also used lightly.